Condensed Milk, otherwise known as "heaven"
At the markets yesterday we bought 3kg of oranges, so we started the day with a big glass of freshly whizzed OJ each and some CADA with natural yoghurt. CADA is a thermomix specialty – coconut, apple, dates, and almonds (but I did a mix of almonds, macadamias and brazil nuts) turbo’d up a few times. We are huge fans of CADA in this house! 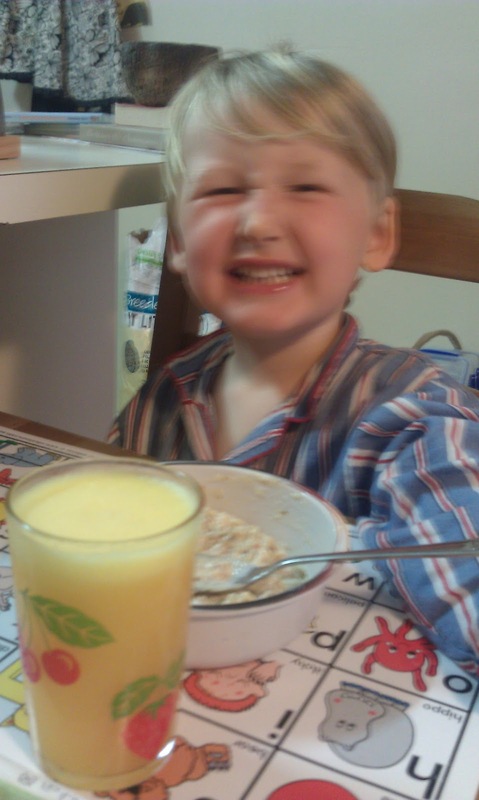 We were also pirates during breakfast, hence Mr T’s blurry “pirate face”. 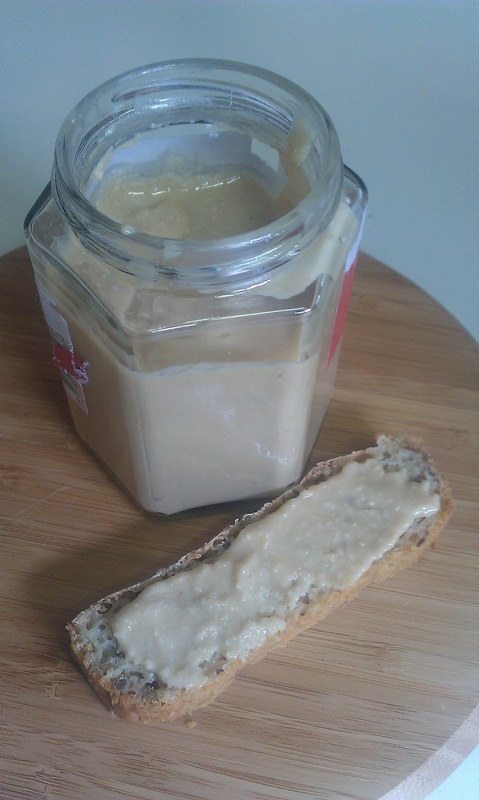 Then we made some peanut butter (just peanuts and cold-pressed macadamia oil crushed in the TM) to lather on the bread for a mid-morning snack. Mmmmm. I haven’t bought processed, fake peanut butter since buying my TM. Real peanut butter is just that wonderful (and cheaper, too!). The bread has been stored in my brand new stainless steel bread bin! Woohoo! I’m very excited about this… All the bread bins around seem to be plastic, but I finally found a stainless steel one on sale last week, so I snapped it up! Then we had a break from the kitchen, and came back just in time to cook dinner. We had bought a wonderful whole chicken at the markets yesterday, so it was another roast on the menu! We did a paprika, lemon and thyme chicken with – you guessed it! – more thyme oil. 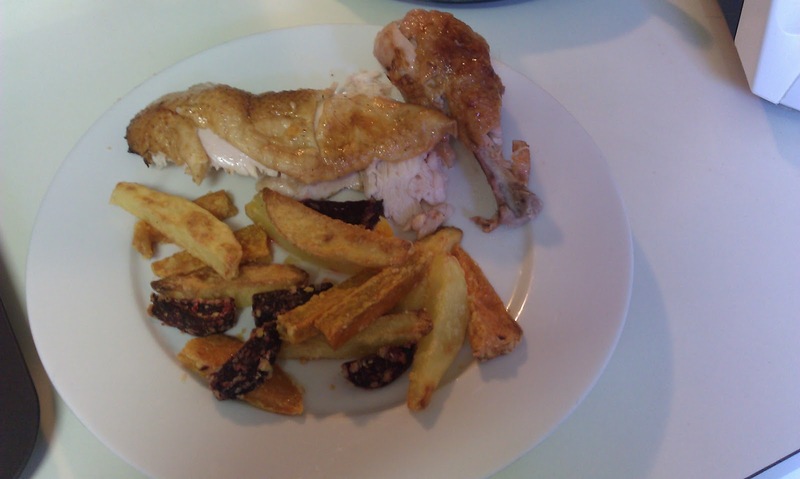 Plus oven-baked “chips”, but we did a mix of potato, sweet potato and beetroot to get more of a variety of veg rather than just potatoes. It was absolutely finger-licking good!!! While the dinner was cooking in the oven, we braved homemade condensed milk for the first time. I’ve been wanting to do this for ages, as the canned stuff is less than ideal. Ethically-speaking, Nestle is not a brand I would like to continue supporting. Health-wise, canned foods are a no-no; most companies use BPA or “epoxy resin” linings in their cans, and there are also plenty of loopholes allowing for certain additives not to have to be disclosed in certain amounts, so you never really know exactly what’s in your food. Anyway, the homemade condensed milk was absolutely perfect! Well, it was perhaps a bit too sweet – my recipe needs a little alteration so I will delay posting it until it is absolutely ready. But nonetheless, it was divine. I tasted a wee spoonful, and muttered to myself, “oh my goodness, this is just heaven!” Mr T then came racing into the kitchen saying, “Mummy, can I try some of that heaven?! ?” I tried to explain that it’s not called heaven, but he wasn’t buying it… Condensed milk will be known in our house from this point forward as Heaven, and rightly so!!! After dinner, my mother and sister came over, so we used some of the condensed milk to make mango ice cream for everyone! Just frozen mangoes (flesh scooped out into a big bowl & frozen), frozen milk, cream, and the cooled condensed milk chucked in the TM and blended up for a couple of minutes. I used a recipe from one of the TM cookbooks, but I would have like it to be even more mango-y. 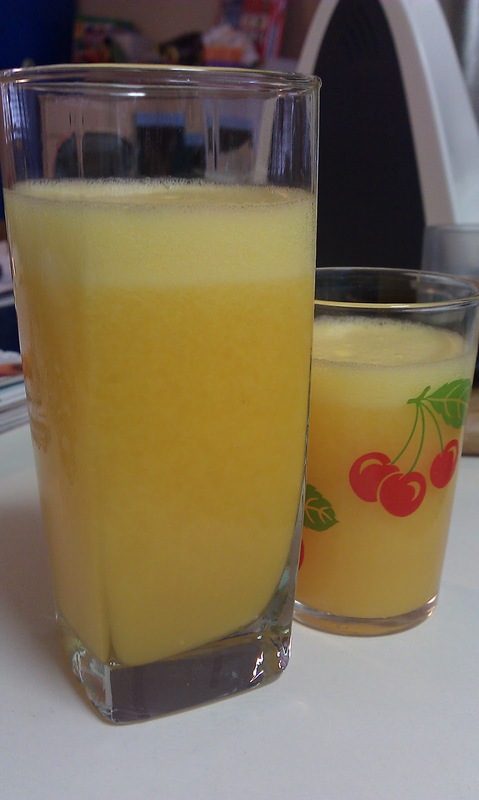 Luckily, we still have plenty of condensed milk and plenty of frozen mango – so we can experiment!!! Nonetheless, it was a hit. 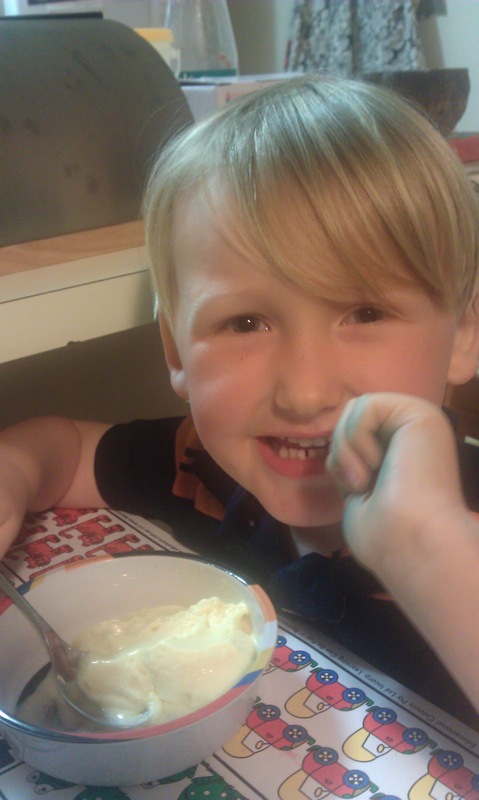 Guilty as charged, I drizzled a little extra “Heaven” on top of my ice cream. Deeeeeeeeeelicious! 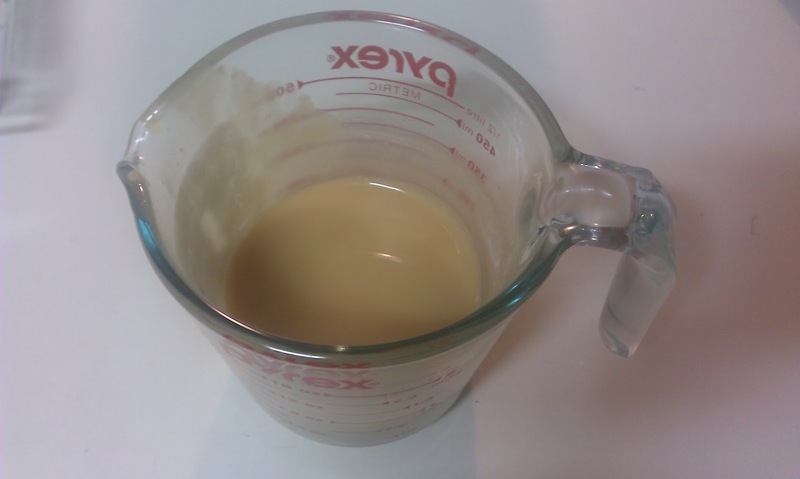 Update: I’ve posted my condensed milk recipe (for the thermomix) here. Update: Thermomix head office took the recipe down, so it can now be found in my Vanilla Ice Cream post. 1) Pull the leaves off half the thyme sprigs and bruise lightly in a mortar & pestle. Add oil and leave it to sit while you prepare the chicken. 2) Take chicken out of fridge about 2 hours before you want to serve dinner. Let it sit on the bench (out of direct sunlight) to reach room temperature. This will take approx 1 hour. 3) Preheat oven to 220 degrees celsius (430 fahrenheit). Remove the neck & giblet if not already removed, and rinse chicken under cold water. Pat dry. 4) Slip your hand under the skin & loosen it over both thighs and breasts. Slip a slice of butter under the skin on top of each breast & thigh. 5) Cut the lemon in quarters. Squeeze the juice from two quarters over the chicken and rub into the skin, then put all lemon quarters into the cavity with the remaining thyme sprigs. Tie the legs together with kitchen string. 6) Rub the chicken with paprika, then brush with thyme oil. If necessary, sprinkle with a little extra paprika. Season with salt and pepper. 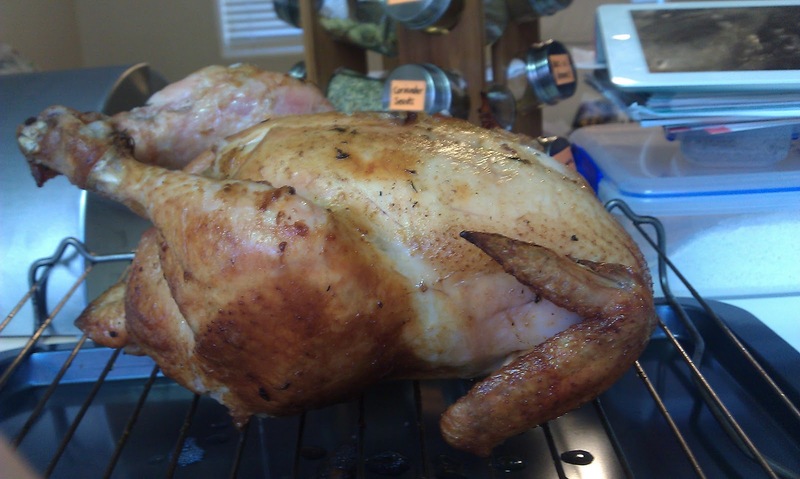 7) Place chicken breast-up on a wire rack in a roasting pan. Roast for approximately 1 hour, turning every 20 minutes, until juices run clear. 8) Remove from oven, cover and stand for 10 minutes before carving. great blog. could you pls tell me where we find the condensed milk recipe?